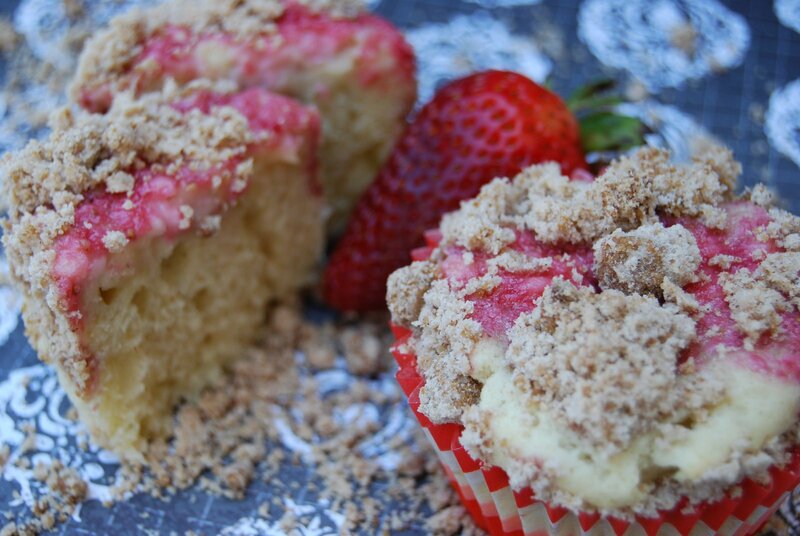 I made these Strawberry Cream Cheese Coffee Cupcakes many moons ago, but I recently came across the photo I had, and thought I would share the recipe with you here on my new site. 1 1/4 stick unsalted butter, room temp. ~Preheat over to 350F Place cupcake liners in pan. ~Whisk flour, brown sugar, cinnamon, and salt, cut in butter with fingers, two butter knives, or pasrty blender, until combinded but still has a crumble. Refrigerate for 15 mintues, al least. ~Whisk flour, baking soda, baking powder, and salt together. ~With mixer on med-high cream butter and sugar until fluffy. ~Add eggs one at a time, make sure each egg is fully incorporated before adding another. ~Add flour mixture and sour cream alternating (start with flour, end with flour) until fully mixed in. ~Mix cream cheese, egg, sugar and pureed strawberries until fully incorporated. ~Sprinkle crumbly topping on top and bake for 20 min. Categories: All-Amerian, Baking, Cake, Cupcakes, Fruit, Sweets | Tags: All-American, baking, breakfast, cake, Coffee cake, cupcakes, dessert, strawberries, sweets | Permalink.